Roberta Warshaw Art and Design: An Unusual Day to Say the Least! I don’t know quite where to begin about today so I guess I will begin at the beginning. I began my usual routine. Woke up about 7 Am, made coffee and settled in to read the blogosphere and check my e-mail. Well according to my e-mail there were a lot of views and comments on my flickr site so I checked in there first. Much to my surprise someone congratulated me on being on Polymer Clay Daily. Whaaaaaaaaaaaaaaa????????????? Are they kidding? So I fast tracked it over to Cynthia Tinapple’s Polymer Clay Daily blog and there I was. Just like that. I couldn’t believe it. I have never had such a feeling of elation in my life. I almost started to cry. Really it doesn't take much. Cynthia and her blog are really very special to all of us in the polymer community. It is my opinion that she has single handedly united the international polymer clay community in a way no one else has. Every single day 5 days a week she is out there discovering new artists and not only blogging about them but researching them as well. She not only tells you where the artists are from; she links you to all the sites where their work can be found as well. She is a dedicated soul and we in the polymer clay community should be so grateful for all her hard work and diligence. You know, I don’t get out much. I have constant multiple family obligations and when I am home I am just locked away in my studio. It is my comfort place. The internet has been good for me as far as meeting new people who do what I do. Today I spent most of the day meeting new friends on Facebook and flickr and answering e-mails congratulating me due to the overwhelming response to her blog post. I also sold 2 items from my Etsy shop. All before I finished my coffee! Then, shortly after that news, I received an e-mail from Izzy Winterhart of Love My Art Jewelry reminding me that my guest blog was posted today. I had totally forgotten that today was the day that was to be published. She asked me a few weeks ago and I was so honored to write for that wonderful blog. So I was in two places today! Very exciting. And now before I forget, I have one more thing to post about. You know I love stamps! I am all about the stamps. Especially letters and dingbats and design stamps. I can’t get enough of them. Well, Lori Anderson is giving away a set that I absolutely covet by Impress Art at PJ Tools. If you want a chance to win them go to her Pretty Things blog But I hope you don’t win them because I WANT THEM!!!!! Kidding. Go for it and may the best man/woman/child win! 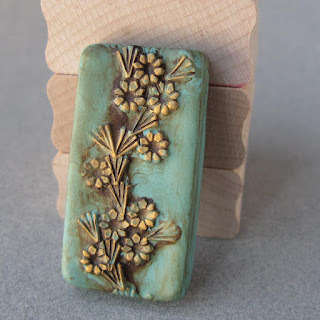 Congratulations on your post at Polymer Clay Daily! Awesome! Hope your back is feeling better. Roberta, congrats! Love your new things! To see something really crazy, check your flickr stats or google analytics stats (if you are set up on that). An appearance on PCD will net you about 10 times your normal hits. very very very congrats ...! Wonderful post Roberta. Your work is more than worthy of the mention and it felt like I'd had a "brush with fame"! All you say about Cynthia and her impact on the polymer clay community is so true too. Samunnat would not be in the form it is if it was not for her steady, strong support. She seeks no accolades and takes no credit but has had a profound impact on us. She made our website, features the ladies work, gives ideas and skills and connects us so that we feel a part of this lovely community that you talk about. A community that rejoices with one another like we all do with you. Good News to celebrate on Nepali New Year I think!!!! Congratulations Roberta. Just got home from work and checked PCD. (my schedule is even more wacked than usual this week). Congrads on the PCD feature. I know. Normally I get between 40-80 views a day in my Etsy shop. Today, 1375......yikes! WOW, congratulations! The accolades are so well deserved! Congrats! It's always nice to be recognized for your talents and accomplishments. Roberta'I'm just seeing this now. Congrats-that is really cool to be showcased like that!